Pop quiz: How many times this year have you watched the news, scrolled through Twitter, or read a news alert and thought, “The world is a dumpster fire”? More than you care to count, right? The year 2018 was far from picture-perfect: Families are being separated at the border, gun violence continues to be an epidemic, and our president cares more about impressing his Twitter followers (both real people and Russian bots) than protecting the citizens of our country. That said, there are some good things that happened in 2018. Believe or not, the world wasn’t a total and complete dumpster fire the whole year. There were genuine moments of goodness that filled our hearts with love and light. So when you reflect back on everything that happened this year, while it’s crucial to acknowledge and learn from the bad, it’s also important to remember the good. Here are 25 feel-good stories from 2018 that will make you smile. Can you even imagine your life without the wisdom and fierceness of Jonathan, Tan, Karamo, Bobby, and Antoni? Because we certainly can’t, henny. We cheered for Adam Rippon, the first openly gay man to compete for the U.S. at a Winter Olympics. We screamed when Mirai Nagasu landed a triple axle. And we LIVED for the fact that Chloe Kim became the youngest woman to win an Olympic snowboarding gold medal (just moments after tweeting about a breakfast sandwich, to boot). Portia surprised Ellen on her show with a nature reserve for gorillas in Rwanda. A few months later, Ellen’s pal Ashton Kutcher stopped by to donate $4 million to the cause. Cue all of the tears. That moment when the whole school finds out they’re going to see Marvel’s new movie, Black Panther! #ronclarkacademy #blackpanther___#Repost Ron Clark・・・The students just found out we are all going to see BLACK PANTHER! We will have a day of cultural classes, African dancers, historical lessons and then we will all go see the film! Turn up!!!! 2018 was the year of Black Panther. The film broke a ton of box office records and touched the lives of many. But perhaps nobody loved it more than students who were surprised with tickets to Black Panther screenings. We can explain: The orange tint was the result of a sandstorm. Still, the photos were pretty unbelievable. Pregnancy rumors swirled for months, but the rapper stayed mum. During her first number on SNL, she managed to hide her baby bump under some seriously styled fur, feathers, and fabric, plus some strategically-placed props. So when the camera slowly panned out to reveal Cardi B’s adorable baby bump, we weren’t only excited, but relieved. And even though she and her daughter’s father, Offset, have since announced their split, we’re still happy Cardi brought beautiful baby Kulture into this world because we know she brings her mama joy. After 17 people lost their lives in February’s tragic Parkland, Florida school shooting, the Parkland survivors-turned-activists refused to be silenced. They continue to hold lawmakers accountable for their actions and make a huge impact on the nation. Please don’t forget that there was a Destiny’s Child reunion. And it was largely thanks to the work of the late Michelle McNamara and her gripping true crime book, I’ll Be Gone in the Dark. The provocative music video can be hard to watch, but it sends an extremely important message. She made a fashion statement and a political statement. The singers squashed their remaining beef when Katy sent Taylor a LITERAL olive branch the first night of the Reputation World Tour. Maybe we’ll see a duet in 2019? After Fox gave the beloved show the axe, roughly 24 hours later, NBC swooped in and saved it. We were so excited, we danced like Sgt. Terry Jeffords after one drink. What a year to be a royal, or a royal enthusiast. The entire world watched as Prince Harry and Meghan Markle said their “I dos” back in May. As if that wasn’t enough, we were also treated to the wedding of Princess Eugenie and Jack Brooksbank. Harry, Meghan, Eugenie, and Jack aren’t the only royals who had a great year. In April, Prince William and Kate Middleton welcomed Prince Louis (pronounced Loo-ee), their third child. 17…and another on the way! Though Meghan is one of the newest members of the royal family, she’s the one on everybody’s minds. We swooned, cried, and started picking out baby names when she and Prince Harry announced in October that they’re expecting. The director reached a major industry milestone with A Wrinkle in Time. She became the first black woman to direct a movie that grossed over $100 million domestically. She shut down a sexist reporter, got super real about the struggles of motherhood, and spoke out about sexism in tennis. Yep, she’s still our queen. Don’t worry, there’s already a sequel in the works. Big midterm wins include Kyrsten Sinema, the first openly bisexual person elected to the Senate; Rashida Tlaib and Ilhan Omar, the first Mulim women in Congress; Ayanna Pressley, the first black congresswoman from Massachusetts; and of course, Alexandria Ocasio-Cortez, the youngest woman ever elected to Congress. We’re with them. 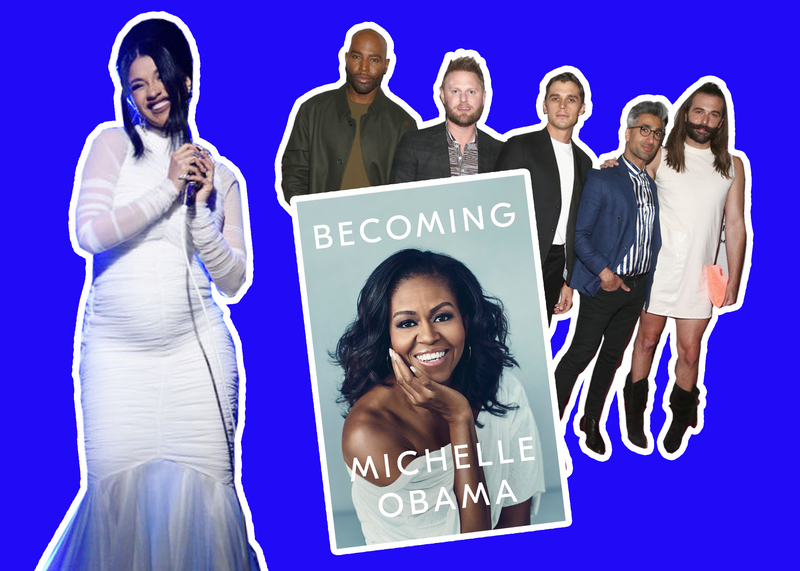 In Becoming, our forever First Lady got super real about her marriage, her struggles with infertility, her time in the White House, and so much more. Even though Steve Carrell said once and for all that he’s not interested in rebooting The Office, fans are still treated to MANY epic mini reunions. Most recently, Jenna Fisher gathered the Dunder Mifflin gang for brunch. The music video pays tribute to some of our favorite movies and is filled with SO many Easter eggs.